Written by Isabella Anderson Surrounded by the fantastic tropical nature of the South Pacific area and with a magnificent view of the deep blue ocean, we can find the Resort & Spa Cristal Ballena, one of the magical resorts that Costa Rica offers for those who decide to visit this country. This Mediterranean style hotel located in Costa Ballena, Puntarenas – about 4 hours from San José – offers 19 fully equipped suites with a panoramic ocean view, the “Spa Cristal” which provides cosmetic treatments and therapies and the “Pura Vida” pool bar and restaurant that features international and Costa Rican cuisine... It is such a beautiful Costa Rica hotel. Here, in this four star hotel, you can find the perfect place not only to rest in company of the sea breeze, perfect for a Costa Rica vacation; but also to meet with business partners or sharing with your friends or family an exotic venue for a celebration. For this, the hotel also offers the “Salon Cristal”, located on the first floor of the restaurant area. This event room has capacity for 100 people and can be rented for many purposes – such as meetings, seminars, delightful incentives and romantic weddings. Additionally, the hotel offers the possibility to book more than 16 of the best guided toursas whale watching, main attraction of the area, Corcovado National Park visits and – for those who carry adventure expectations in their luggage – canopy, rafting or kayak. 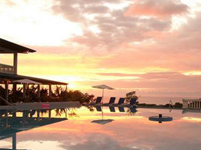 Cristal Ballena is the ideal Costa Rica resort for a total getaway!